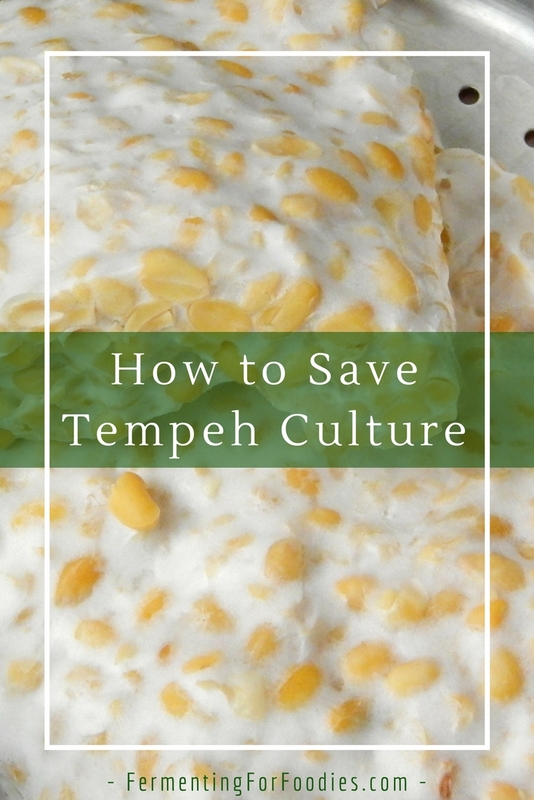 It is not always easy to purchase tempeh starter (especially if you live on an Island off of the west coast of Canada) so I recommend learning how to save the mold spores for future use. The good news is, that if you’ve already successfully made tempeh, then you’re well on your way to making tempeh starter! All that is required to make tempeh starter is to allow the mold to continue growing until it spores, then to collect those spores. Please note: the photo above is tempeh before it spores. Spores are exactly like this but grey and black. They are very unphotogenic, and I just couldn’t stomach putting a picture of black tempeh up on my blog. One recipe of basic tempeh (see notes). 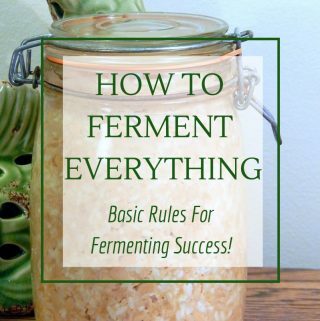 Follow the instructions for basic tempeh, then continue to ferment until the mold spores. You will know that the mold has spored because your tempeh will go from being mostly white, to black. The black colour is from the spores. (Approximately 60 hours after starting to culture). Take off the lid off of the fermenting container to allow the tempeh to dry out. When it is dry, use a blender to pulverize the tempeh into a dust that can be used as a starter for future batches of tempeh. Store the starter in an airtight container in the fridge or freezer. -You will need to start by following my basic tempeh recipe. -Make sure that everything is very sterile so that you have a good strong culture. 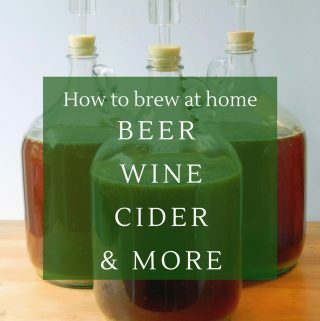 While this is always a good practice when fermenting, it’s even more important when saving culture. Read up on various sanitation and sterilization procedures. -The strength of the tempeh starter will depend on how many mold spores grew before you dehydrated the tempeh. You may find that your own saved mold spores grow more quickly or slowly than the store bought spores, just adjust your culturing time as necessary. Your instructions are very helpful. I was just wondering, what proportion of your homemade tempeh starter would you use when making your homemade tempeh? For instance, let say I am using 4 cups of soaked soy beans, how much of your homemade tempeh starter should I use? Hum… it really depends on how well the culture saved. You could follow the basic recipe, which would be about 2 tsp. How quickly it grows will just depend on how strong your culture is. Either way it should culture. Let me know how it goes! I really want to try this but I’m unsure of how to harvest the spores and all the methods of drying. Would you be willing to make a youtube video on how you do it? Im sure it would save people alot of money. Hum… I’ve never done a YouTube video. Maybe next time I make tempeh spores. Is there anything you particularly need to know? I want to harvest at the correct time so I’m wondering what dry culture spores on the tempeh would look like at that time and if I need to blend the entire block of tempeh or I can just cut a thin layer with the dry spores on it. When the tempeh turns grey/black, then it is sporing. You don’t have to dry it out completely. But it shouldn’t be obviously moist. I generally blend up the whole brick, as the mold permeates through the whole thing. However, if you want to just remove the top layer that should work as well. This is awesome. I bought organic tempeh from store, can I dry them and make a basic recipe??? Yes! if it fresh. If it has been steamed or processed in anyway, then it probably won’t be able to spore. Enjoy! How can i tell if its been steamed or processed? If you buy tempeh it most likely has been steamed or processed. Otherwise it will quickly spore. I had to buy my initial tempeh starter on line. Good luck! You said 1/2 teaspoon starter culture for a pound of beans, but my starter culture says use the whole pack for 2 cups of beans. What’s up with that? I would follow the instructions on your pack. Especially if it’s your first time making tempeh. If a pack is way more than 1/2 tsp, maybe they aren’t sure about viability? How much you need to use is really dependent on how vigorous the culture is. Having too much culture isn’t as much of a probablem as having too little. Found this blog after I made my own tempeh starter by saving a piece of tempeh I made of bought starter. Not knowing the way I mixed this saved piece (that was still white and not even spored or blackened yet) about the size of a finger with a cup of store bought rice flour and crumbled it within the rice flour. I then placed the mix in a vented plastic ziplock bag and left it on a shelf in my hot water boiler room. After a week I noticed it had gone fuzzy. Then i proceeded with a trial tempeh batch. I was very surprised, it was a success. I now have a second generation tempeh starter. 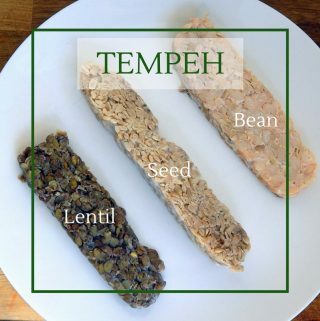 I only found one tempeh starter from CulturesForHealth but they have mixed reviews on viability. I looked on ebay and amazon, no luck. Where did you get yours? I originally bought mine on cultures for health, and it worked well. They do make and keep a lot of culture, so that might be one of their issues with viability. There are a few fermenting Facebook groups where you might be able to get culture. Good luck! I’m making tempeh with Rhizopus oligosporus instead of Rhizopus oryzae and apparently oligosporus always makes the tempeh look black/grayish. It’s my second batch with this rhizopus and it was accurate. Which means that my tempeh isn’t white anyway. So, if i want to make my own tempeh starter, how do i know that the tempeh is ready to be dried out? I’m sorry, I haven’t used that strain. However, I would try culturing it for 60 hours and see what happens. Most likely it will stay black. It should be sporing after 60 hours, so try using that as your starter the next time around and see how it works! Good luck! Hi, that was very interesting. Thank you! I have my very first batch going now and I was to try saving the spores. How long should it take for the tempeh to dry out? 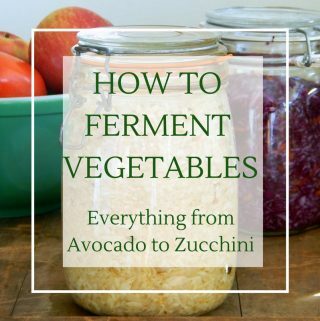 If fermenting in an oven, can I simply leave it in there without a lid on? Just taking the lid off will work. The oven vents, so it should dry out. It will take 1-3 days to dry out depending on the moisture of your tempeh. Good luck! Thank you for instructions. There is a previous question about using store bought tempeh as starter. The only way I’ve located tempeh is frozen. Will freezing stop it from culturing after thawing? It depends on whether the tempeh was steamed before being frozen. Steaming kills the mold, however, freezing directly after culturing won’t kill the mold. Try it?